I mentioned in one of my first posts that I’ve been reading a lot of books on writing and publishing that I hoped to put together into a separate writer’s resource page. That will still happen. However, as I’ve been reading and taking copious notes, I decided I wanted to do more than just give a list of helpful books. I decided to do a series of blog posts that summarize some of the best advice and try to let you know if it’s worth reading the whole book. 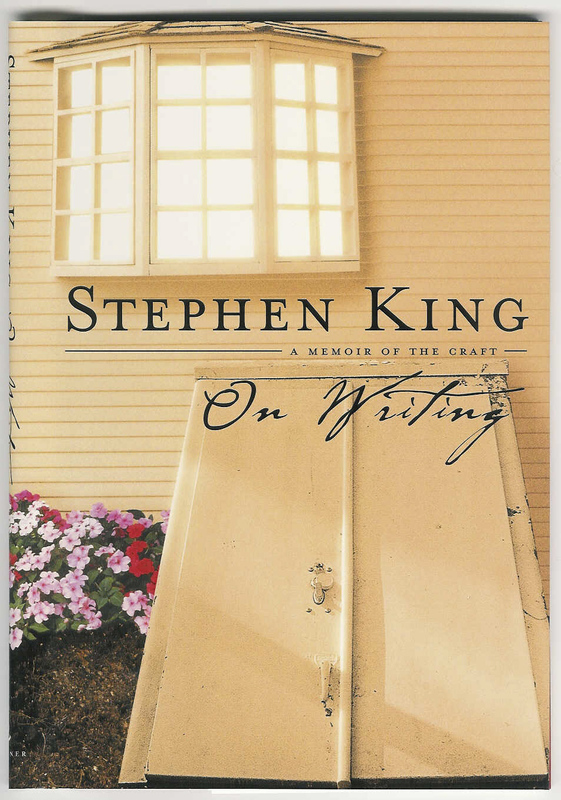 The first up is Stephen King’s On Writing. I have to confess the only Stephen King I’d read up until this point was his column in Entertainment Weekly, which I miss greatly. I don’t know what his horror is like, but the man’s nonfiction is funny! This book had been referenced in multiple other writers’ resources and on countless blogs, so I thought it was probably worth a look. On Writing has been out for thirteen years and my county library has five copies. I can’t renew it because there are two people on the waiting list. Yes, it’s that good. The book is half memoir and half practical writing advice, but all of it is fabulous. At the very least, put it on your must read list, but it might be one worth owning. Until you can get around to it, here are what I thought were the ten best tips. 2. Perseverance. This is not something King specifically mentions, but you can’t read about his early years and not realize this was part of why he succeeded. He used to hang his rejection slips for his short stories on a nail. Eventually he had to switch to a spike to hold them all up. The first novel he ever sold, Carrie, was actually the fourth novel he had written, and he wrote it while holding down two jobs and helping his wife raise two small children. Well crap. Now I’m in trouble. King’s point is you should have written the scene well enough via showing not telling that the adverbs and super verbs are unnecessary. A simple “she said” should do the trick. I had a beta reader tell me this already, but I was trying to ignore what I knew was excellent advice because it would mean a lot of revising. Dang it, now I’m going to have to do it. 4. “If you want to be a writer, you must do two things above all others: read a lot and write a lot.” This piece of advice has been quoted in numerous other books, and it was a relief to me. I felt like the time I spent reading was time I stole directly from writing. King counts it as part of his daily working routine. That’s right, it’s work time. It doesn’t all have to be War and Peace, either. Read what you like, and often you can learn just as much from the terrible books as the good ones. If what you read just made you go “blech!” make sure you don’t do that yourself. Don’t neglect the second piece of advice, either. King says as a new writer you should have a goal of at least a thousand words a day and write six days a week. He reads about eighty books a year and writes two thousand words a day, seven days a week (even on Christmas and his birthday). 5. You need a door. Your writing space doesn’t have to be fancy, and it doesn’t have to be absolutely silent if you work better with music, but it must have a door. You must close it. I write in a comfy chair in our living room. This space is rife with interruptions, and I keep telling myself I need to move to an empty bedroom upstairs. I haven’t done it, and if I’m honest about why, it’s because I kind of like the interruptions. 8. “The first draft . . . should be written with no help (or interference) from anyone else.” This forces you to focus on telling the story, not fixing things based on criticism or slacking off if you get too much praise. It also helps keep the momentum going while you’re excited about what you’re writing. I’m not sure how I feel about this one. I’ve always had at least one beta reader giving me feedback as I write each new chapter. I’m willing to give it a try, though, and see how it’s different. 9. Let the first draft rest for at least six weeks. That’s right, six weeks. No rereading yourself, and if you give it to beta readers, they have to keep their comments to themselves for those six weeks. Start on your next project and don’t think about the old one at all. Once you’ve got six weeks between you and the initial frenzy of writing, you can go back and start revising for your second draft. You can be a lot more objective this way. ← Blogging Experiment: The Results!